Inspiring spaces enhance the learning experience. In 2014, the University of Dayton School of Education and Health Sciences prepared for a major move to an impressive new space. After many years in Chaminade Hall, it was time to upgrade and expand into the 6th floor of Fitz Hall (previously known as College Park Center). The updated space, filled with light and overlooking campus in all directions, features upgrades more suited to the learning process. Technology abounds, as do open, inviting spaces perfect for collaboration on group projects or relaxing between classes. 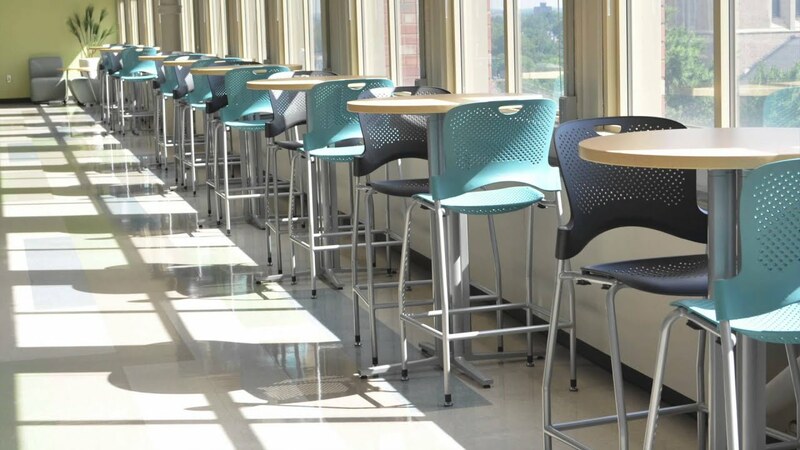 APG worked closely with the University to incorporate existing furnishings, making sure all new installations met the established standards as well as future needs. The 66,000 square foot space includes 15 large classrooms and 80 faculty and staff offices, as well as lounge and collaborative spaces. The APG team was able to meet budgetary and scheduling needs for the University, bringing cost-conscious solutions that would serve the department well into the future. As construction operations drew to a close, APG installers worked carefully alongside other trades, maintaining flexibility to avoid disruptions at the worksite. With Just-In-Time Delivery, the team was able to deliver precisely the necessary pieces for each day’s work, thus reducing time and space needed on-site, and allowing completion of this major project in a very short amount of time. With APG’s help, the project was completed nearly a month early, giving faculty and staff ample time to relocate and prepare for students. The beautiful and inspiring space encourages focus, collaboration, and productivity among students and faculty alike. This engaging new environment will also serve to attract students to the University.